The dual wall construction provides insulation to help keep the water temperature hotter for longer while keeping the outside of the kettle cool to the touch. With clear window display to instantly gauge the desired volume for heating. Smooth rounded design with 1.5L capacity for boiling water quickly and quietly, a stylish addition to any kitchen. With soft touch handle is robust, stable and easy to grip, designed for maximum comfort and performance. 5 year replacement warranty against manufacturers faults for household use. KEK1522 Kettles Frosted Pearl is rated 4.8 out of 5 by 16. Rated 5 out of 5 by Alison Number9 from Love everything about this Kettle I bought this for my Birthday, in the Sale, very glad I did. I always buy myself a Christmas and Birthday Present. Love this so much, it's my third Kitchen-aid item, and most used one as well.The temperature control means I can make my herbal tea's, Coffee's and Its great for keeping the water warm with the thick walls. I made risotto with the water and didn't need to keep boiling the kettle to keep the water hot, the thermometer on the front fantastic. It's a talking point when people come to visit, they have seen them in the shops one of my friends left and went to buy one straight away! 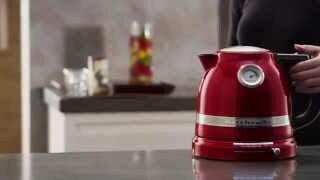 Rated 5 out of 5 by Lynda from ProLine series kettle Absolutely love ot. Favourite feature is the temperature gauge. No more reboiling when I don’t have to and saves on power. Rated 5 out of 5 by Carrie from Elegant and does the job I bought the Candy Apple Red kettle to go with my other KitchenAid appliances. I am impressed by how quickly and quietly water is boiled. The analogue temperature gauge on the kettle is an excellent feature to see if the water is still hot enough without needing to keep the appliance turned on at the power socket. Rated 5 out of 5 by Carmel 66 from Kitchen Class After months of research I bought this kettle on 30/12 and am very happy with its performance. The classy design,choice of temperature ( my husband likes drinkable coffee & I hot beverages)no more arguments, quickness to heat, outer side of kettle doesn’t heat great safety feature !! Rated 5 out of 5 by AnnR from Quiet and quick I have had this kettle for a week or so now and it is fantastic. Comfortable to pick up, pours beautifully, has a heat protected lid close spot and most importantly gets to set temperatures quickly and quietly. It looks and feels really lovely. Rated 4 out of 5 by Neet from Sturdy and great features, and colour I bought this last week and so far love it. The colour is fabulous, and it's strong. My only negative, if it is one, is that the water measure is a little difficult to see.